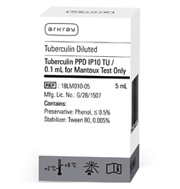 Tuberculin PPD | ARKRAY, Inc. Diluted ready to use Purified Protein Derivative solution for Mantoux test. Highly purified material, calibrated against WHO approved standard preparation (RT23) for better accuracy. Available in 5 mL and 1 mL pack size. Filled in amber coloured glass vials to prevent the loss of potency in regular usage and stabilized with Tween 80 o prevent absorption of tuberculin proteins to glass surface. Tuberculin P.P.D 5 TU/0.1 mL. Tuberculin P.P.D 10 TU/0.1 mL. Tuberculin P.P.D 1 TU/0.1 mL. Tuberculin P.P.D 2 TU/0.1 mL.